Maximize potential of disabled/disadvantaged/special-needs children providing developmental therapy, education and recreation through horses and the environment, with measurable improvement physically, mentally, socially and/or emotionally resulting in increased self-sufficiency and the ability to lead better and more independent and productive lives capable of contributing to society. 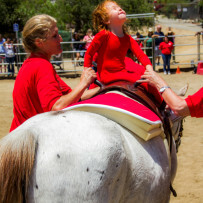 AHEAD With Horses serves hundreds of individuals of all ages and disabilities throughout the greater Los Angeles area with a primary base in Shadow Hills and a mobile program site at Sullivan Canyon in Brentwood. Program services are comprehensive and combine the benefits of physical, occupational, speech, educational and recreational therapy; psychological and sociological counseling, other developmental services such as behavior management, sensorimotor services, etc. Two unique aspects of this therapy are the immediacy of response and visibility of its effectiveness across multiple domains (motor, communication, social, emotional, cognitive, self-help, vocational). Predicated on the philosophy that everyone can learn and achieve, the emphasis is on working with those others feel lack the ability to respond. Most have not responded to traditional forms of therapy and/or education, or are not eligible for other services. AHEAD stands for Accelerated Habilitation Education And Development. We receive much more than we give. Those we are privileged to work with teach us all that we know! We depend on the validation and support of the public.